Taylored Expressions November Stamp of the Month Blog Hop! Hello! It's time for the Taylored Expressions Stamp of the Month and Key Ingredients Blog Hop! I LOVE this month's stamp set-In the Garden. It's full of mason jars, flowers, and paper lanterns-fabulous! It coordinates with this month's Key Ingredients Kit which features paper from Fancy Pants Happy Go Lucky. You can also purchase the coordinating Patio Party Dies! For my card, I stamped the hanging wire images and then used my Stamp-a-ma-jig to line up the mason jars. I used Copics to color my images and sponged around the panel with Ranger Antique Linen Distress Ink. 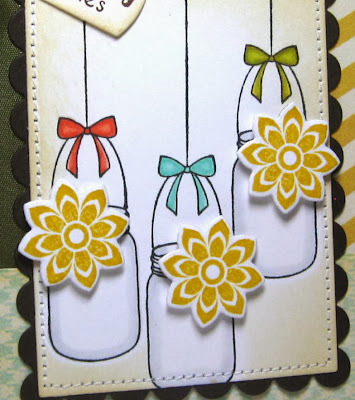 I stamped three of the flowers and cut them out with the coordinating Patio Party Dies. I popped them up with foam tape over the jars. The fishtail panel was cut with a Banner Stacklets 1 Die, and I also stamped my sentiment onto a Designer Mini Tag Die. I used ribbon from the Key Ingredients Kit and then tied my tag onto the ribbon. A very sweet and simple card! This is a true stunner, Kerri! Love it! 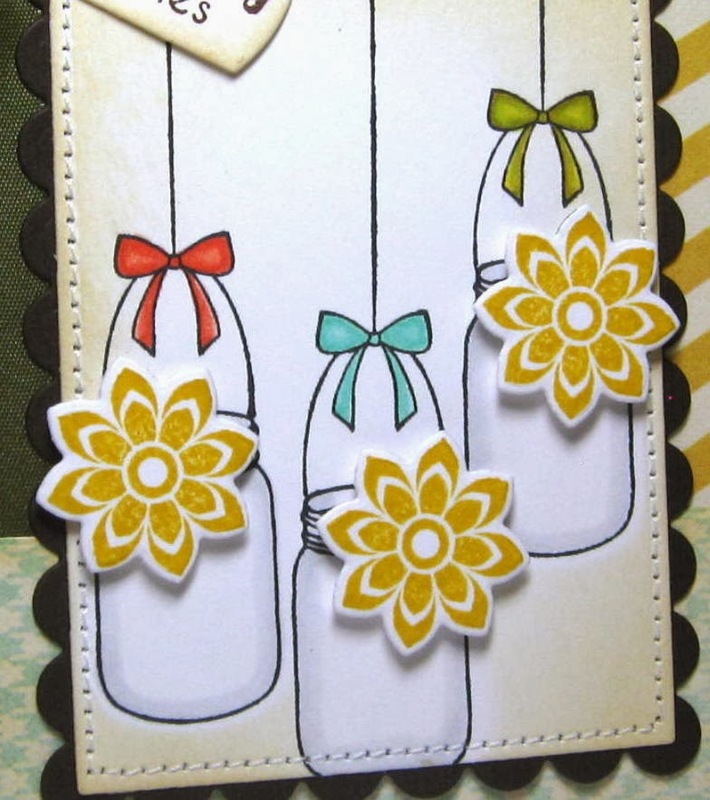 Your little hanging jars are sooo cute, Kerri...love how you added the flowers and the cute little tag sentiment!!! Absolutely gorgeous Kerri! I love your layout and how you used this months kit and SOTM! Beautiful, Kerri! Love your trio of hanging jars! This is so cute! I love the jars! Pretty papers too! Gorgeous card, Kerri! 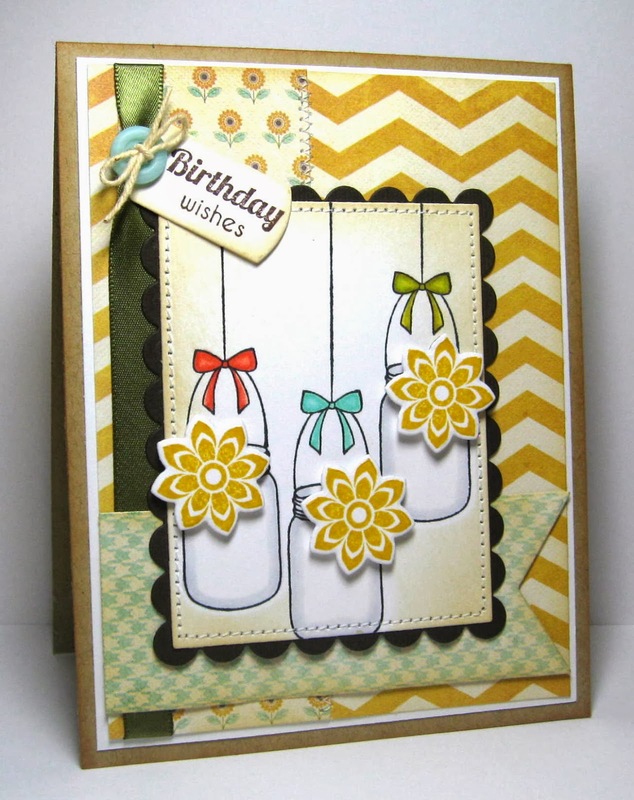 I love the color in your card and the flowers are so pretty with the jars! Hope you're having a great week! I just love the hanging jars!!! Such a cute idea to use the jars in that way! Love your card design, too. I love the hanging ball jar vases.